Below you will find the re-created 22nd S. C. Battle Flag, S. C. State Flag and the 3rd N. H. Battle Colors and Regimental Colors. This is a replica Battle Flag of the 22nd South Carolina Volunteer Infantry. The flag is a re-creation from other similar S. C. Battle Flags, there is no records of what the flag actually looked like. This flag is of the St. Andrews Cross design, which is patterned after the Flag of Scotland. The flag is an Army of Northern Virginia design for Infantry, it measures 52" X 52". It has 13 White Stars for all of the States that were recognized by the Confederate States of America. It is not known what happened to the Battle Flag(s) of the 22nd S. C. One is believed to be one of the 'Unidentified Battle Flags' at the Museum of the Confederacy in Richmond, VA. One possibility is on page 71 #WD279. 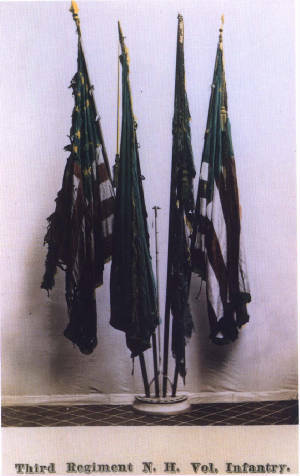 This is a Charleston Depot issue flag April 1863 and it was captured by Cpl. August Kause of the 15th NY Heavy Artillery at the Battle of Five Forks, VA on April 1st, 1865. 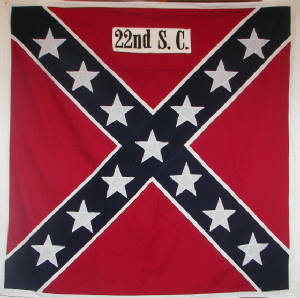 It is also believed that the 22nd SC carried a 1st National Pattern Flag as its Battle Flag during the years of 1861-1862. This evidence can be found in Evan's Brigade Quartermaster's records in Charleston, SC. COMING SOON: The 3rd New Hampshire Volunteers Battle Colors. The original 3rd NHV Battle and National Colors are in the New Hampshire State Archives and are not on display. These flags are in great need of preservation.